MoonMarble.com - Florin Voicu - "Wasp Marble"
Art Glass → Contemporary Handmade Marbles → Florin Voicu - "Wasp Marble"
Florin Voicu - "Wasp Marble"
Handmade contemporary marble by Florin Voicu. 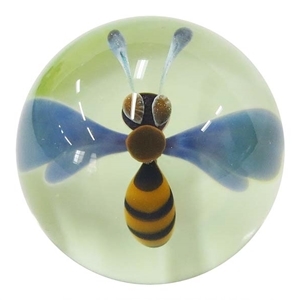 This marble is a compression style marble featuring a expertly wasp with a yellow and black striped body. The wasp hovers over a pale spring green background. Approximately 1 1/8" in diameter. Bruce Troeh - "Baseball Marble"
Aaron West - "Orange, Green, and Silvery Dichroic Vortex with Opal"
David Salazar - Large "Van Gogh Floral Marble with Base"